The C-Bus 5750PWL PIR Outdoor Occupancy Sensor / Motion Detector will operate under all weather conditions and features long-range detection with immunity to false triggering. The unit can be used for garages, driveways, porches and outdoor living areas. It also provide you with peace of mind by automatically lighting up an area to deter would be intruders and trespassers. 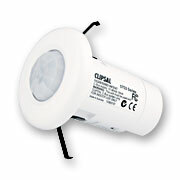 The C-Bus 5750PWL PIR Occupancy Sensor is suitable for outdoor use and has a field of view of 110 degrees and a detection range which extends 18 metres. The unit features a light threshold adjustment on the unit. The time delay is programmable in the range 1 second to 18 hours. Features a Sunset Switch program and is powered from C-Bus. Occupancy Sensor / Motion Detectors offer enhanced security, convenience and energy savings.